Beyond providing data for all 32 NFL teams, PFF also supports network broadcasters with game-preview packets that are used to enhance the in-game experience for fans and viewers. This Ravens-Browns preview features the same information our broadcast partners use for team research and in-game production. Mayfield: The future of the Browns? 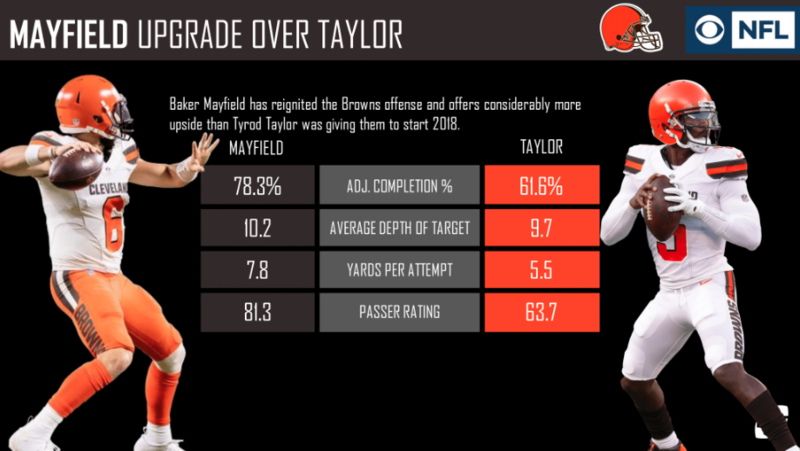 Baker Mayfield has been aiming downfield at a much higher rate than Tyrod Taylor and has been more accurate while doing so. Mayfield’s 10.2 average depth of target shows his upside, and the 7.8 yards per attempt mark displays how efficient the young quarterback has been in his short 2018 campaign. 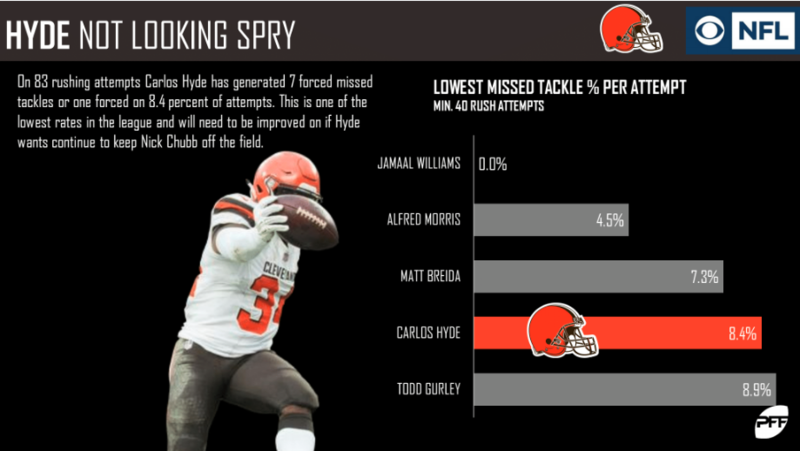 Browns’ running back Carlos Hyde ranks first in the league in rushing attempts (83), but he hasn’t been as efficient as the team would like him to be. His forced tackle percentage is one of the lowest in the league, not a good sign for a player with young draft picks sitting behind him hungry to get on the field. 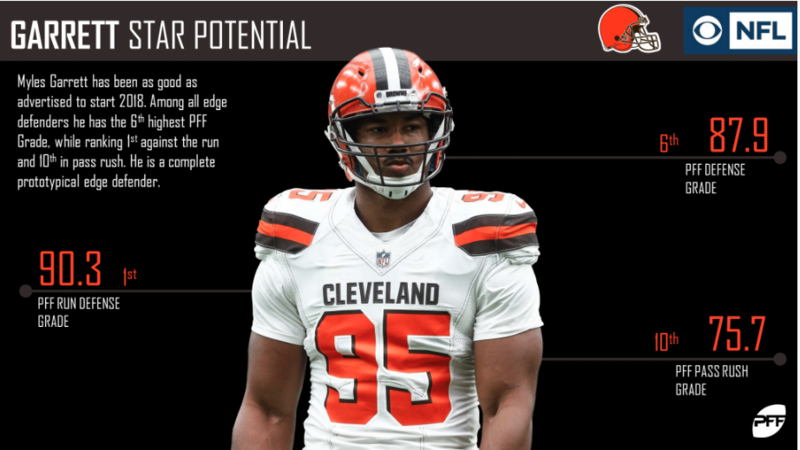 Browns’ Myles Garrett is a prolific edge-rusher, who has made a name for himself by pressuring opposing quarterbacks. An area of his game people aren’t as aware of is his ability to stop the run. Through four games, Garrett ranks first among all edge defenders with a 90.3 run-defense grade. 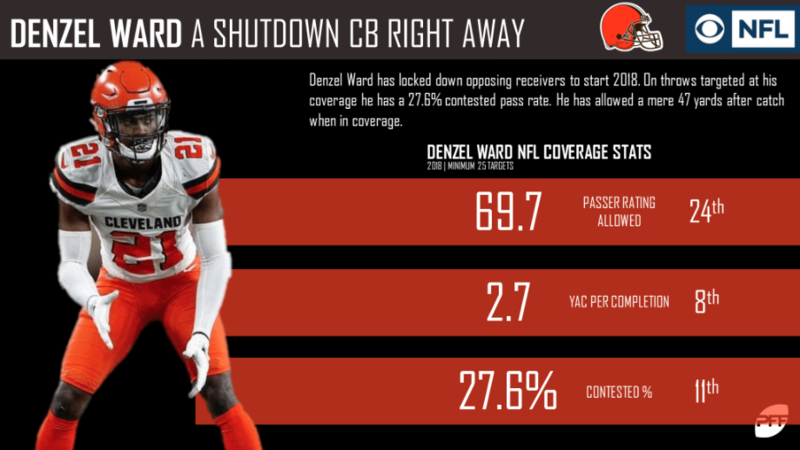 Rookie cornerback Denzel Ward and his 27.6% contested catch rate haven’t made it easy on opposing wide receivers. Ward has the eighth highest defense grade in the 2018 draft class (77.7) as well as the third highest coverage grade (82.4). 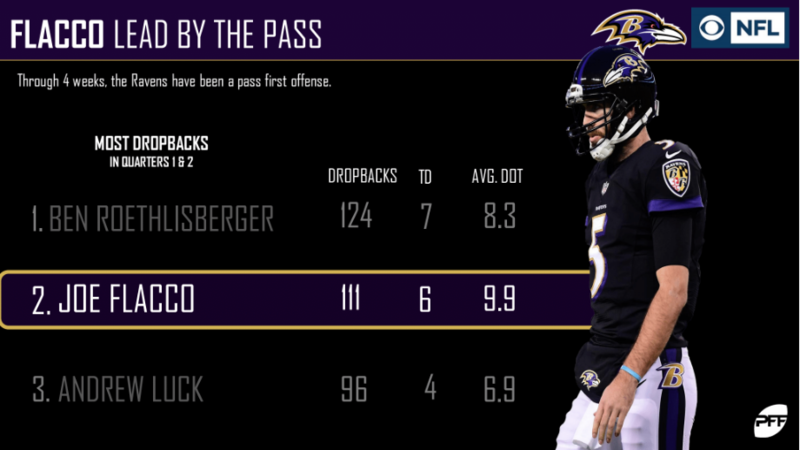 Baltimore Ravens’ quarterback Joe Flacco has dropped back to pass 171 times this season, but 111 of those dropbacks came in the first half. This strategy has worked out well for the veteran quarterback so far. 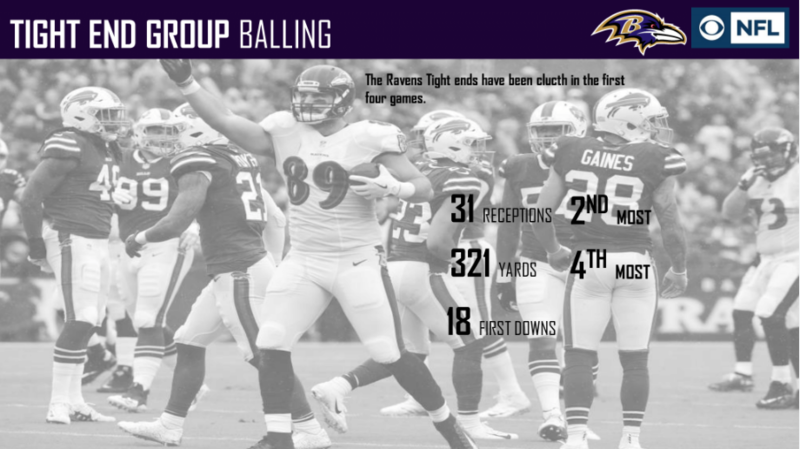 Before the start of the season, the Baltimore Ravens’ tight end group was believed to be a weak spot on the roster. Now, the position group is a large part of the team’s success, and Hayden Hurst has yet to make his NFL debut. The group has the fourth most yards (321) and the second most receptions (31) from tight ends in the league. 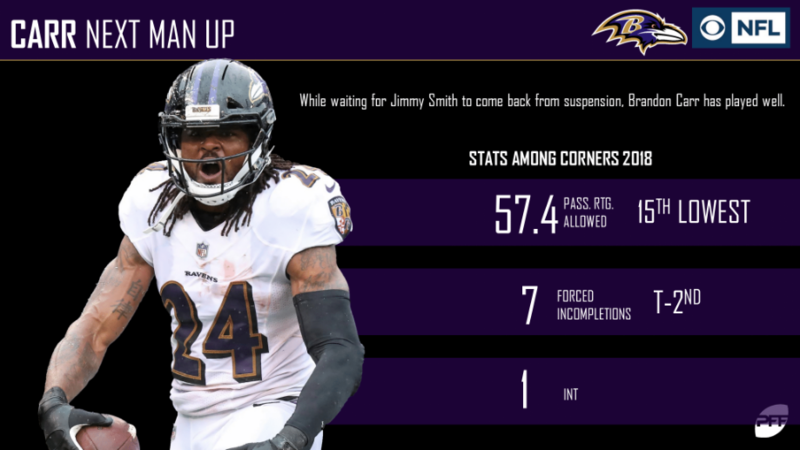 The Baltimore Ravens viewed veteran cornerback Brandon Carr as a placeholder for suspended Jimmy Smith before the season, but Smith now has a 72.9 season grade, which is well above league average, as well as the highest grade among Baltimore’s cornerbacks. The Ravens’ defense has been a no-fly-zone with the second-highest team coverage grade in the NFL (86.7). This success has been due in large part to their stellar safety duo of Anthony Levine Sr. and Tony Jefferson. 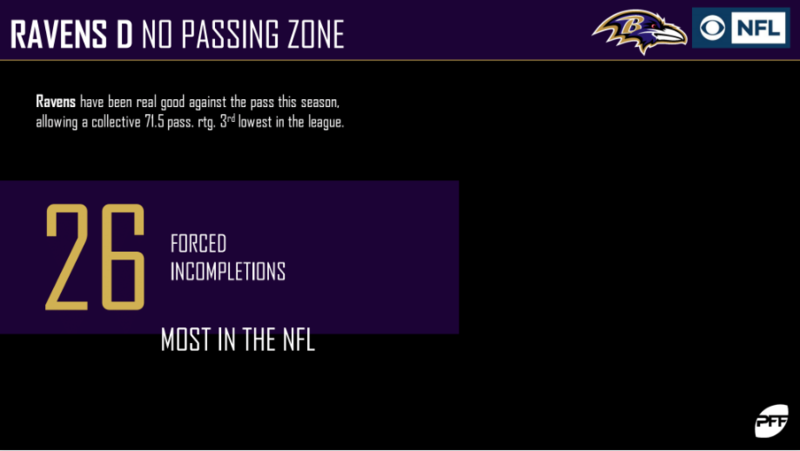 PFF Greenline has projections for the spread, moneyline and over/under of the Ravens’ matchup with the Browns. Get its picks here.